Uvita & Dominical Whitewater Rafting - Discount Tours! After relaxing and soaking up the sun in the sleepy towns of Domical and Uvita, you might be ready to set out for a bit more exciting Costa Rica adventure. If that is the case, our Dominical whitewater rafting tours departing from Uvita and Dominical in the Costa Ballena are perfect for you! Let us whisk you from the beach and take you deep into the rainforest on your choice of 3 different river rafting adventures in Costa Rica for a full day of exhilarating fun! Whether you are trying whitewater rafting for the first time, or you are an avid paddler, we have rafting tours for every skill level. 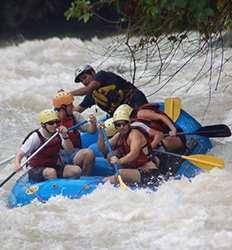 We offer three different river rafting tours in Dominical with different degrees of difficulty. For our first timers, we recommend the Class II and III rapids of the Savegre River rafting tour. Are you really wanting to get your heart racing? For our more experienced rafters we offer the Class III and IV rapids of the Naranjo River rafting tour and the Guabo River rafting tour. In addition to the thrill of paddling through whitewater rapids, you will also have the opportunity to immerse yourself deep into the lush coastal rainforest that makes the Costa Ballena so special. Booking with The Real Deal tours ensures you get the best deals in Costa Rica on only the best whitewater rafting in Dominical & Uvita. 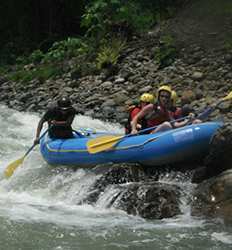 Check out the whitewater rafting in Dominical & Uvita below and choose the best rafting excursion in Costa Rica for you! Are you a serious adrenaline junkie ready for the ultimate eco-exploration adventure? Then get ready for our Class III and IV full day Coto Brus River Whitewater Rafting tour, where we take you down unbelievable whitewater rapids for a no-joke thrill ride. Whitewater Rafting the Coto Brus River (Class III/IV) deposit is $20.00 per person. Traverse heart-pounding whitewater rapids through incredible canyons as you travel 13 kilometers down the Guabo River to the gorgeous shoreline of Dominical Beach, stopping along the way for a fresh Costa Rican lunch in the natural surroundings. 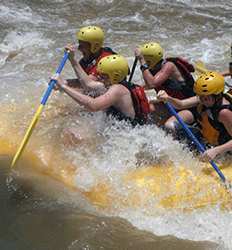 Whitewater Rafting the Guabo River Class II/III deposit is $15.00 per person. Our Savegre River Whitewater rafting adventure lets you explore what is considered to be the most pristine river in Costa Rica. Not light on adventure, this full day whitewater rafting tour takes you through stunning untouched canyons where you can enjoy the lush rainforest scenery before taking on exciting Class II and III whitewater rapids.